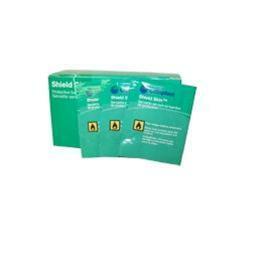 Shield Skin Protective Barrier Wipes are small wet-nap wipes designed to provide a clear, protective plasticized barrier between skin & appliances, external catheters, tapes, dressings, casts, electrodes, incontinent pads & diapers. Gives adhesive extra strength by giving the skin a tacky feeling that supports better adhesion. Ideal for oily skin, high heat, and humidity.